Additionally, the use of flowable fill in other void-filling applications such as basements, tunnels, mines, sewers, and other underground structures like abandoned tanks have increased due to laws being passed by the Environmental Protection Agency concerning below-grade fuel tanks. Flowable fill mixtures are commonly comprised of a combination of cement, water, fine aggregate, and fly ash or slag. Many materials that do not meet the quality standards for use in concrete have been used in these mixtures with favorable outcomes. Chemical admixtures specifically designed for their usage in these mixtures have become more common due to their positive effects on performance. Your local ready-mix producer may suggest mixtures that vary from these components depending on their availability and the specified project requirements. The flexibility in the design of flowable fill mixtures offer numerous advantages to the engineer that must adhere to mix design specifications. Volumetric mixers have performed flowable fill work for almost as long as this concept has been around. Most manufacturers offer a feature on the mixer as part of their equipment or at least as an option to achieve the low strengths required for flowable fill projects. 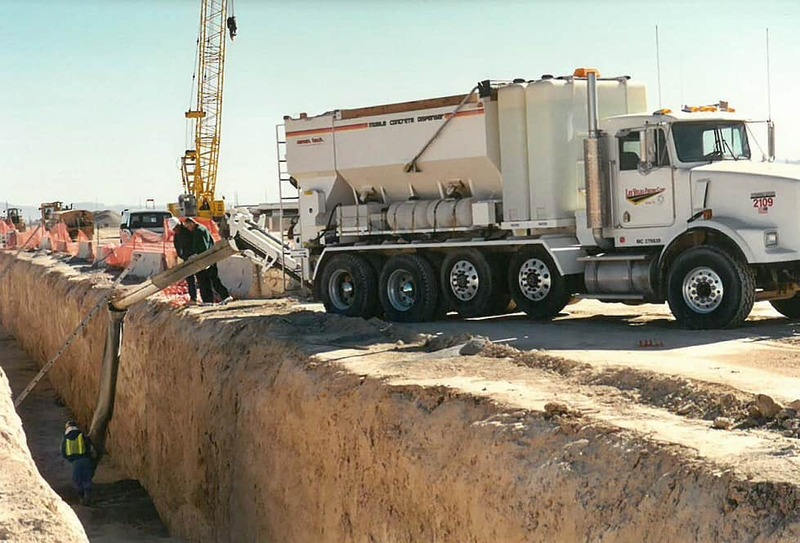 One major project that was completed with flowable fill using volumetric mixers took place in California. AT&T had a small fleet of volumetric mixers which were equipped to produce a low strength fill to cover up their fiber optic lines that would soon be used for high speed internet. This low strength fill was perfect in this project because it was strong enough to protect the fiber optics, but not too strong that it would damage them. A volumetric mixer is capable of producing low strength flowable fill, but with the flip of a switch, it can be quickly adjusted to be used as a higher stength concrete mixer again. This feature allows many volumetric mixer owners to not only be involved in the flowable fill business, but also enables them to complete concrete work with the same machine. 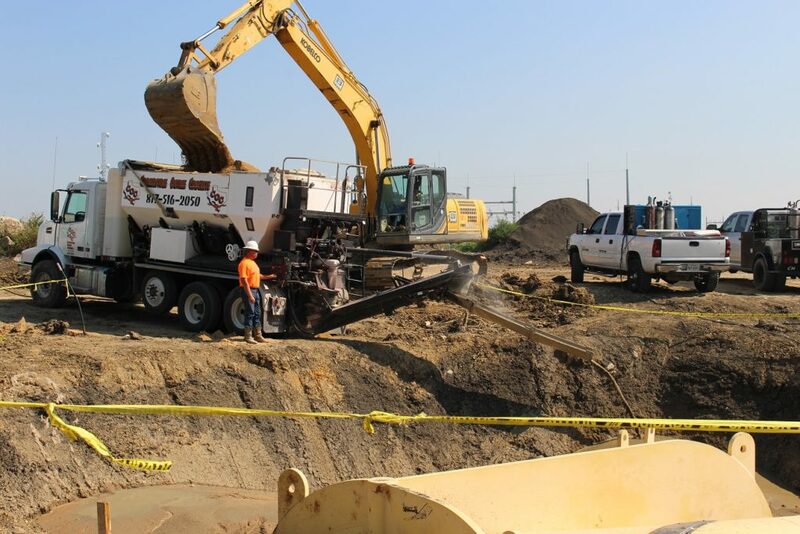 Since AT&T’s success, many municipalities and utility departments around the world are beginning to see the myriad of advantages that volumetric mixers can provide in this general area of construction. Many flowable fill projects are used to back fill utility trenches, but many projects call for vast amounts of this mixture as well. The volumetric industry has manufactured equipment that not only achieves the mix design, but also is able to achieve the production rates required. The yield amount can vary for each different type of volumetric mixer, but the production rates that are required can reach thousands of yards each hour depending on the project. This is typically where one will see a ten yard volumetric mixer that produces over one hundred yards each hour. If you have any questions about extra opportunities that flowable fill or volumetric mixers can provide, do not hesitate to call Cemen Tech at 800.247.2464 or contact us here.